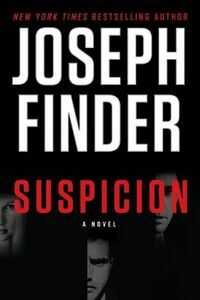 Suspicion by Joseph Finder: Synopsis and Online Purchase Options. Synopsis (from the publisher): When single father Danny Goodman suddenly finds himself unable to afford the private school his teenage daughter adores, he has no one to turn to for financial support. In what seems like a stroke of brilliant luck, Danny meets Thomas Galvin, the father of his daughter’s new best friend, who also happens to be one of the wealthiest men in Boston. Galvin is aware of Danny’s situation and out of the blue offers a $50,000 loan to help Danny cover his daughter’s tuition. Uncomfortable but desperate, Danny takes the money, promising to pay Galvin back. What transpires is something Danny never imagined. The moment the money is wired into his account, the DEA comes knocking on his door. Danny’s impossible choice: an indictment for accepting drug money that he can’t afford to fight in court, or an unthinkably treacherous undercover assignment helping the government get close to his new family friend. As Danny begins to lie to everyone in his life, including those he loves most in the world, he must decide once and for all who the real enemy is or risk losing everything — and everyone — that matters to him.